Try Freshwater Coasteering in Cornwalls most beautiful quarry. Coasteering in our quarry is an adventure unlike any coasteering youve tried before – in Cornwall or anywhere else for that matter. Visiting Adrenalin Quarry is like finding yourself on the set of Jurassic Park. Dramatic cliffs loom over a deep lake, birds scatter as you smack the surface of the water. As with all our adrenalin activities, weve pushed the boundaries of the sport but made it as accessible as possible. So, our coasteering sessions involve wild swimming, tombstoning, an encounter with The Blob and climbing your way across our beautiful Cornish quarry in a truly exhilarating coasteering experience. The emphasis is always on adrenalin and creating an adventure to remember, whether youre 10 or 100, timid beginner or fearless adrenalin junkie. 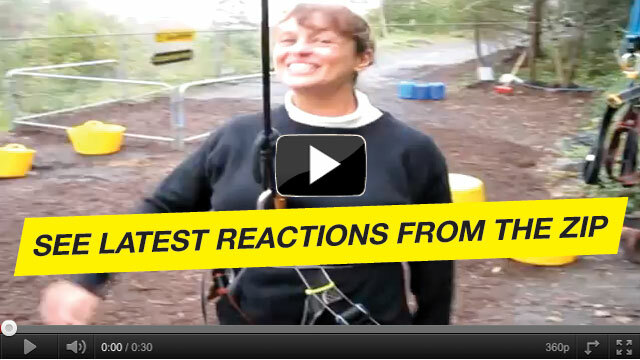 "Adrenalin Quarry made me Adrenalin Junkie!!!!" I visited Adrenalin Quarry on a whim while staying in Plymouth. The swing and the zip wire was so enjoyable, but the swing was a highlight. The view is absolutely incredible and the terror that grips you is a great feeling (to look back on)! After the swing, and feeling as though I could conquer anything, we went on the zip wire. We also got a nice video and photos of the zip wire which are priceless. "Throw your kids off a cliff with a big smile on their faces ! :)"
We visited this venue and were very impressed, four of us rode from my 40 yr old 6ft 4 husband to our tiny 5 year old son, staff were very professional and informative, brilliant with very excitable children with lots of what if questions :)!!! I never dreamed I would summon up the courage to go on the zip wre. But my son (25yrs) wanted to go, so I thought ' well you only live once!' so me, his mum, went too. Amazing, absolutely fabulous - what an adrenalin rush. Would love to do it again. Staff were great and the location and facilities clean and friendly - highly recommend a visit! DO I HAVE TO PAY TO ENTER ADRENALIN QUARRY? No. Entry is free. Many people drive up just to take a look around and watch the jumpers and divers from our spectacular viewing platform on the cliff’s edge. IS ADRENALIN QUARRY SUITABLE FOR SMALL CHILDREN? bouncing every day. There are reserved Aquapark sessions for 6-8 yrs with family and friends at 10am every day. If you prefer driving to diving, we have Kartworld, Cornwall’s top go karting centre. We also have a picnic area where families can sit down, take in the views over the lake and watch the jumpers and there's a play area for the kids, too. Yes. In the cafe and reception areas we do pasties, chips, cakes and ice cream along with hot and cold drinks all year round. You can also bring your own picnic and spread out on the lawn. If you’ve got a big group coming, let us know your requirements and we’ll get you fed on the day. Yes - it’s big thrills, no spills. We’ve gone out of our way to provide a genuinely thrilling experience that gets your heart pumping without compromising on safety. There are regular safety checks across the site, daily equipment checks and replacement well within the recommended time limits. We only use state-of-the-art gear: Petzl pulleys, tri-lock karibeners, 13mm climbing and caving rope lanyards, DMM harnesses, and Kenwood handheld radios. When better equipment becomes available, we’ll use it. This is why families AND adrenalin junkies alike keep coming back to us. I’M WORRIED SOME IN MY GROUP WILL BE TOO SCARED TO JUMP. HOW DO YOU DEAL WITH THIS? We welcome all types of people, from the truly nervous to the gung-ho. Our instructors are friendly and reassuring and are really good at calming the jitters. So much so, that we often find that the people who start off gulping at the start are soon rushing back for more. If you really don’t fancy it, you can relax with a coffee in hand and watch the jumpers on our nice, solid viewing platform overlooking the quarry lake. Or try an activity that doesn’t involve being thrown off a cliff - like Axe Throwing, or Karting. I HAVE A DISABILITY. WHAT RIDES CAN I DO? Every year, we have many wheelchair users and people with disabilities fly down The Zip & ride The Giant Swing. Please call in advance to Buy your tickets and discuss your needs. HOW DEEP IS THE QUARRY LAKE? It's 22 metres at its deepest point. For imperialists, that comes in at 72 foot and 2 inches. CAN WE GET PHOTOGRAPHS OF OUR ZIP & GIANT SWING RIDES? Sure - we've fitted a new video system that captures your zip and swing rides, replays them in our video gallery and posts them straight to your Facebook. See yourself in Slo-Mo on AQ’s big screens, share with friends and download stills of your favourite bit. There’s no escape. Get your video pass here.